BrainLine is a national multimedia project offering authoritative information and support to anyone whose life has been affected by brain injury or PTSD: people with brain injuries, their family and friends, and the professionals who work with them. BrainLine also provides military-specific information and resources on traumatic brain injury and post-traumatic stress disorder (PTSD) to veterans, service members, and their families. Through BrainLine, we seek to provide a sense of community, a place where people who care about brain injury can go 24 hours a day for information, support, and ideas. We want to hear from you. Please send us your feedback and suggestions. 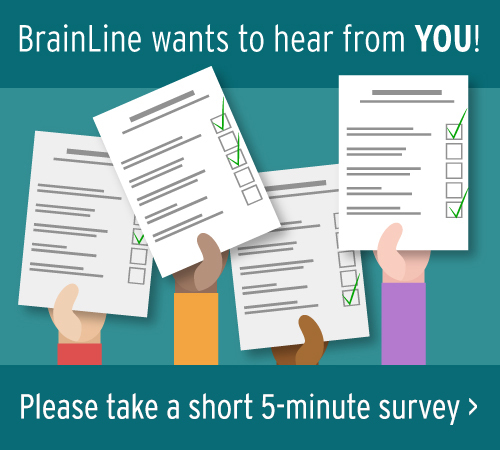 BrainLine's experts review the site and make sure we're up to date on the latest and greatest information and resources. BrainLine has produced more than 100 in-depth interviews with national experts on brain injury and PTSD including Julian Bailes, MD, Jeffrey Barth, PhD, Jeffrey Bazarian, MD, Robert Cantu, MD, David Cifu, MD, John Corrigan, PhD, Richard Ellenbogen, MD, Jamshid Ghajar, MD, Wayne Gordon, PhD, Brian Greenwald, MD, COL Dallas Hack, MD, COL Sidney Hinds, MD, David Hovda, PhD, James Kelly, MD, Jeffrey Kreutzer, PhD, COL Geoffrey Ling, MD, Michael McCrea, PhD, Ann McKee, MD, Daniel P. Perl, MD, Joel Scholten, MD, COL Beverly Scott, MD, Nathan Zasler, MD. View a full list of our subject matter experts. BrainLine works closely with many outstanding organizations to promote education and awareness about brain injury. Including the Bob Woodruff Foundation, Center on Brain Injury Research and Training, Cohen Veteran Health, Infinite Hero Foundation, the International Brain Injury Association (IBIA), Model System Knowledge Translation Center (MSKTC), Ohio Valley Center for Brain Injury Prevention and Rehabilitation, and the Warrior Care Network. View a full list of current partners. Stay up to date on brain injury issues! Our Connect and Share page offers simple ways to get the current news, resources, content, and connections that you need — via email, RSS, and widget feeds, and sharing on social networks. Find out how to subscribe to our daily news headlines and weekly series, including Ask the Expert, Research Updates, Blogs, and Personal Stories. Noel Gunther has broad experience in radio, television, print, and the Internet. He has co-written and co-produced award-winning documentaries for NPR and Public Radio International, including: Good Morning Vietnam with Adrian Cronauer (Gold Award, International Radio Festival of New York); American Voices: Norman Corwin with Charles Kuralt (Grand Award, Best Documentary, International Radio Festival of New York); Gray Matters: Depression with Mike Wallace (Gold Award, International Radio Festival of New York); and Drugs, Alcohol and the Brain with Pat Summerall (Gold Cindy Award, best documentary). For television, Gunther's work includes the PBS documentary A Tale of Two Schools, narrated by Morgan Freeman (Cine Special Jury Prize), and the five-part public TV series Exploring Your Brain (Gold Cindy Award). For the Internet, Gunther developed and now oversees four national sites: ReadingRockets.org, ColorinColorado.org, AdLit.org, and LD OnLine.org, which since 1996 has been the world's leading website in the field of learning disabilities. Gunther is co-author of Beyond Boardwalk and Park Place (Bantam Books), which was named by the New York Public Library as one of the best young adult books of the year. He has also written for The New York Times, The Washington Post, The Village Voice, Washingtonian, American Journalism Review, and many other publications. He is a graduate of Yale University and Harvard Law School. Rosemary Rawlins is the author of Learning by Accident, a Caregiver’s True Story of Fear, Family, and Hope, an inspirational memoir about learning and growing from adversity through the experience of caring for her husband after a near-fatal bike crash. Rosemary has spent eight years as a full-time caregiver for loved ones with brain injury, dementia, and COPD. She has worked as a project consultant and advisory board member for the TBI Model System of Care at Virginia Commonwealth University Health Systems and was appointed to the Governor’s Commonwealth Neurotrauma Initiative(CNI) Advisory Board in Virginia in July 2013. She is also a member of the Virginia Caregiver Coalition and speaks nationally on caregiving topics. Rosemary and her husband Hugh were featured in the 2013 Bronze Telly award-winning video about Relationships after TBI, as well as on the front page of the New York Times Science Section in January 2012. Rosemary has a Bachelor’s Degree in Human Resource Management from the University of Richmond, Virginia, and lives with her husband in Glen Allen, Virginia.